The 6771-yard course at Whispering Pines is a great sample of original Myrtle Beach golf. The (now) rarely seen native landscape has been preserved to allow golfers a truly unique feel.You’ll love the scenery! There are no backyards to distract from the experience. Whispering Pines offers a distinctive combination of challenge and beauty, carved out of 200 acres of towering pines and mature hardwoods by designers Finger, Dye, and Spahn. Tree-lined fairways, carefully placed lakes, and undulating greens await your arrival at Whispering Pines. With above average slope and handicap ratings, this traditional, classic design-style course doesn’t need gimmicks for a satisfying round of golf. Best of all, you don’t have to drive miles to find peace and quiet. We’re located just one half mile from the outstanding oceanfront hotels and attractions of Myrtle Beach, and we are just across the street from the Myrtle Beach Airport. Perfect for an extra round before or after your flight. 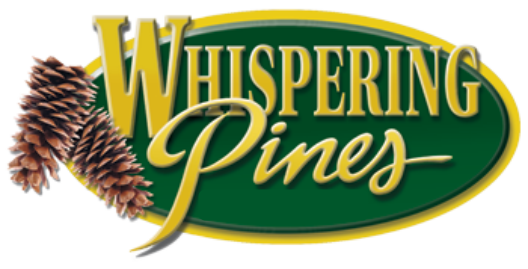 At Whispering Pines, you’ll discover affordable rates, convenient location, outstanding service, and challenging golf. We also offer golf lessons for all skill levels at the Whispering Pines Golf Academy. To book tee times online click HERE or for more information, contact us today! 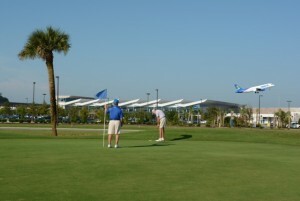 Make Whispering Pines Golf Course your first and last golf stop in Myrtle Beach. Ship your clubs to the Pro Shop and save yourself the airline hassle and headaches!